As many of us become parents at a later stage, when our adult lives are well established, the arrival of a baby brings an unpredictability that can be hard to cope with. Those who are used to managing their time in the workplace can be tempted to try to manage their infant in the same way. So-called "controlled crying" has been recommended by many recent childcare guides, but parents should be aware of the high cost of such methods to their baby. In The Essential First Year Penelope Leach shows parents how they can reach a harmonious balance between their baby's needs and their own. While babies and their needs have not changed, our lifestyles have, and Penelope Leach has written the perfect manual for busy 21st century parents, which spans from pregnancy to the child's first birthday. The guide is a gentle, but timely reminder that the fundamental purpose of having children is to share happiness. The happier a baby is, the more parents will enjoy being with him or her; being responsive to one's baby does not mean that it has to be at personal expense - the happiness of parents and baby is inextricably intertwined. 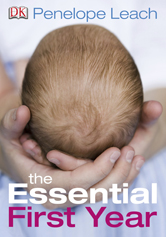 The Essential First Year is not just full of sensible, practical advice, it is backed by more than ten years of new research into infant development, especially in brain growth, which now confirms, for instance, just how much fathers matter to their infant's progress, how girls' and boys' brains are different at birth (and develop differently) and how helping a baby to be calm, contented, amused, and interested leads to optimum development of body and brain. Using such information, Penelope Leach shows parents how to deal with problems as well as how to prevent them. Every parent wants to do the best for their baby and for the child that the baby will become. The Essential First Year gives parents the knowledge and the tools to nurture and care for every aspect of their infant's life - to meet the baby's physical needs, to stimulate their intellectual development and ensure their emotional well-being - and most importantly, The Essential First Year helps parents to simply enjoy being parents.